This 5.9m x 2.8m extra large garden shed can be used as a man cave workshop in larger suburban backyards. 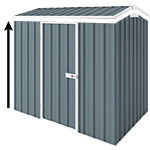 This Cheap Sheds Workshop is our largest model sitting at 5.9m x 2.8m. It provides that extra length you need for a fully walk in workshop which can have an extended workbench area as well as ample storage space for electrical equipment, tools, chemicals and even made a few boys toys! FREE Masonry Anchors (Valued at $70) - to secure your shed to the slab or foundation. Important for your safety and to keep the shed grounded. Great solid, roomy shed. was a bit worried about the skylights but no they were good as well. Everything about the shed is great apart from 3 things. 1. at 6'6" I have to crouch to get in and whack my head on the support beams, but I will for every shed. 2. the instructions were atrocious. the parts that were different sizes were labelled the same. the angle of the roof we guessed off the plans because they were not given. the video was for a different shed. Hi can you tell me the height of this shed and can you go bigger and cost say another metre both ways? Hello there, This shed has 1.78m wall height and comes in 5.9m x 2.8m size as standard. Feel free to check out our 7.5m wide catagory for larger sizes here: http://www.cheapsheds.com.au/garden-sheds/7-5-metre.html Thanks.